There is a long tradition of a church choir at St. Chad’s, with adult and junior sections. Most services have a choral element, and our choir has many loyal, long-serving members who sing at the weekly services. At present, we have 3 junior members and 12 adults. We are fortunate, however, to have further help from a number of associate choir members who join us whenever they are able, and for special services. We would really welcome more junior and adult members, who would be taught informally, how to read a musical score, matters relating to voice production, and the basics of music theory, whilst contributing weekly to the choir. Following several weeks of rehearsing under the leadership of John Fellows, St Chad’s Church Choir took part on Saturday 7th October 2017 in the RSCM (Royal School of Church Music) Choirs Festival held in Lichfield Cathedral. 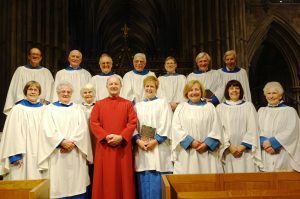 With several other local choirs, the members of the choir performed six pieces including two hymns, an anthem, a psalm, Magnificat & Nunc Dimittis and a blessing (Ubi Caritas), all within a special evensong service conducted by the Cathedral’s Director of Music, Benjamin Lamb, with Cathy Lamb playing the organ.